Look at this photo of cars driving in a city. 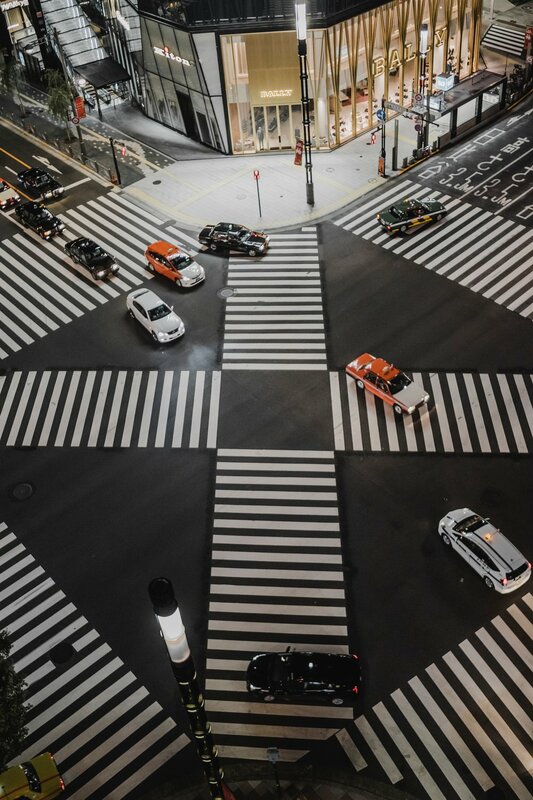 When cars cross an intersection, they are located in the intersecting space created by two streets. These are special places, and although we pass through them regularly, points of integration, crossing over, and connecting are where great potential exists. It’s a moment where you can take a different turn or intercept other traffic. This analogy applies to our professional identities. Some people stay in their lanes (they only do one job and have one title), and others don’t (they do multiple jobs and are more than their title). The people who change lanes and work from the intersections are hybrid professionals. When two streets combine, suddenly there is ambiguity, uncertainty, more possibilities, and collisions may happen. Intersections are fascinating and important places in our professional identity because it is where we are more than one thing at the same time. It is where ideas, identities, and skills collide. Hybrid professionals are all around us. They’re a segment of the workforce hiding in plain sight—both from themselves and from their employers since most don’t know they are hybrids. This concept has not been coined or called out in society, until now. I believe hybrid professionals (or hybrids for short) are a revolutionary way of thinking about professionals. Have you ever met a hybrid professional? I bet you have and didn’t realize it, or maybe you are one, and don’t know it yet. What are hybrids? Hybrids are professionals who naturally combine multiple skillsets in uncommon ways and use that to their advantage in their work. Consequently, they are innovative in how they work and are one-of-a-kind at what they can do. I know a designer who develops dynamic creations because he merges various digital technologies together, a VP of sales who really makes his living as a male coach and matchmaker, and a former TV producer who leads school reform in a large urban school district. These are hybrids. They have a knack for effortlessly shifting between perspectives and blending them into a whole new skillset, making these professionals truly exceptional at their work. Their job title might be “VP of Sales,” but they excel at so much more. They are more than their title. Hybrids are not chameleons, changing from one thing into another or trying to blend in, and they’re definitely not unicorns because they are not rare nor are they imaginary. Instead, hybrids are like X-Men (or X-People) because they can do what’s expected and surreptitiously combine their talents together in supercharged ways, delivering better (often unimaginable) results that provide great value. I am a hybrid professional. I call myself an artist/researcher/educator/designer. For years, I’ve been trying to explain how it is that I’m able to do what I do. To be honest, I didn’t even understand how to talk about the phenomenon that I was experiencing in my work. I could do my job, but I knew I was so much more than my title. What was I really good at? What was I really doing in my daily work? Why did no one understand what I really do? In 2014, I started researching and interviewing people, and I realized I wasn’t alone. Hybrids are part of the workforce, and it’s time to start talking about them and helping people realize their value to employers and to clients.